To my delight the postman brought me the latest Wheel of the Year ritual box from Wicca Moon this morning. 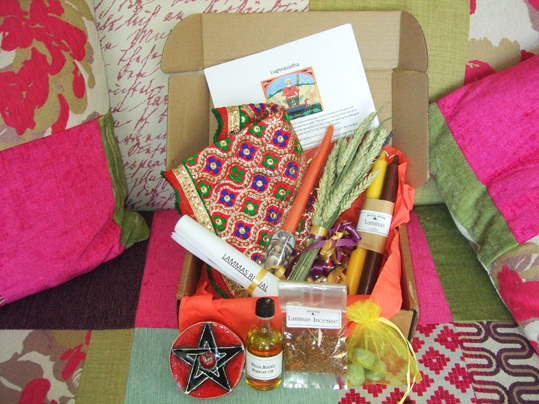 It is a kit to celebrate the Lammas/Lughnasadha festival, which marks the start of the grain harvest in the Wheel of the Year. Of course I opened it up immediately to look at the lovely contents - and I took the photo above. This is the fifth Wheel of the Year kit I've received from the pagan shop in Eltham, and I'm loving them. Their arrival is something I really look forward to and each one is a box of delights. I'm particularly pleased that the box arrived so quickly after it was posted to me as I will be doing my personal Lammas ritual rather early this time. I am going away for Lammas itself and want to do this rite before I leave.